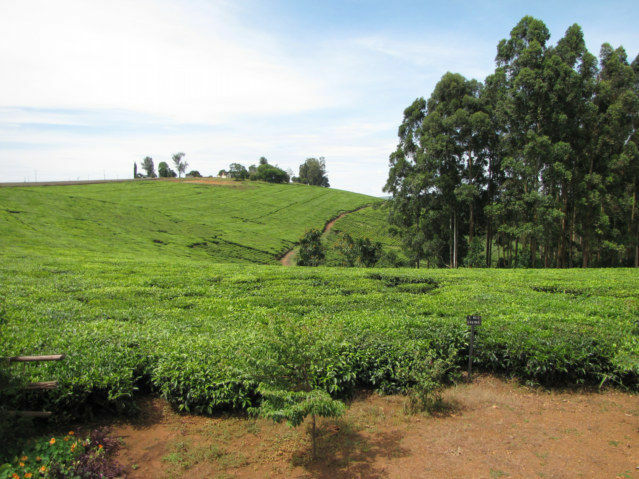 I visited a Tea Plantation in Kericho, Kenya, this was a beautiful place. On the road between Queen Elizabeth Park to Ishaka, Uganda is another Tea Plantation area. I poked the camera out the door of the van as we stopped to pick up some more passengers and took this photo of tea growing. Tea appears to grow at altitudes between 1000 and 1500 meters above sea level. I think 1300 to 1500 is the optimum level above sea level in the tropics. At this altitude the living conditions are as good as they get, warm days and cool nights, no snow, and in many ways permanent spring. If I read or hear about Tea Plantations, consider me in, I will be visiting the location.